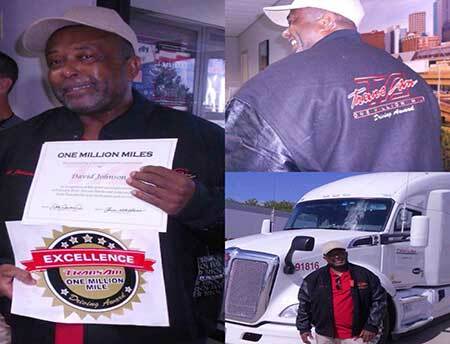 We are proud to announce that David Johnson joined the ranks of TransAm Trucking’s Million Mile Achievers! What does it take to be a Million Mile Achiever? Each driver shares the same 3 qualities: dedication, safety, and pride in being truck drivers. It’s no secret that loving what you do makes it easier to succeed. David joined TransAm Trucking in March 2007 and is now a regional driver down in Texas. In all his years with TransAm he never delivered a load late. This shows he sees the value of time management and is dedicated to delivering his freight on time. To reach a million miles, you have to be willing to put in the miles. David did and is still going strong. Each Million Mile Achiever was recognized as a TransAm’s Top Performer on more than one occasion. David Johnson is no exception. He has been a Top Performer 34 weeks out of 41 this year. In addition, his driving record is not marred by major events. There are no accidents on his record. David works diligently to do his job safely. Putting in the time and effort to drive a million miles safely shows pride in the trucking industry. Truckers deliver everything from food to gasoline. Trucking a rewarding industry because everyone depends on it. Thank you David Johnson for choosing TransAm Trucking. We appreciate your dedication and hard work; it’s a reminder that truck driving is a noble profession. Congratulations on your Million Mile Achievement.